In 2013, BMW will enter the electric drive automobile market with a brand new model, the BMW i3 that will revolutionize the way car are being manufactured. 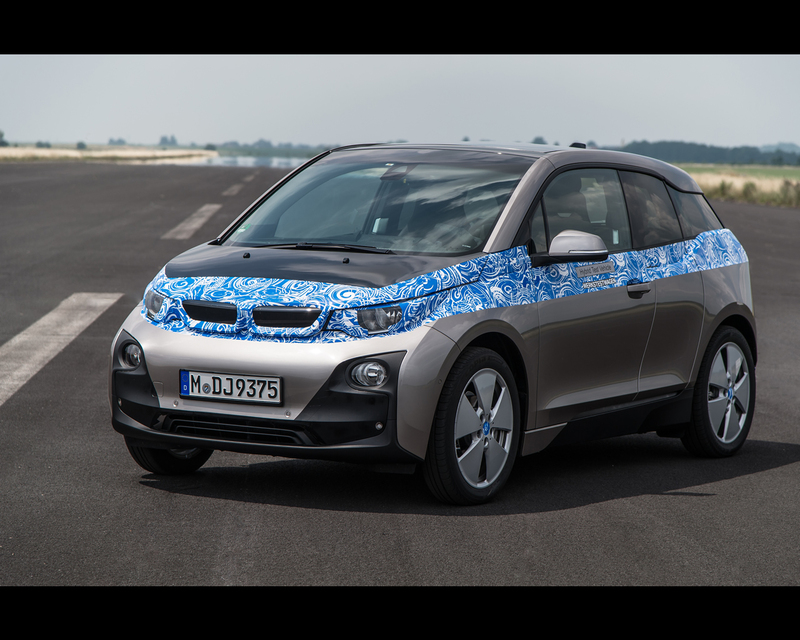 The BMW i3 will be presented at 2013 IAA Frankfurt Motor Show as the first electric BMW of a new brand BMW i dedicated to electric drive systems. The BMW i3 is a premium four seats automobile with all-electric propulsion and optional range extender. It will be launched on the market by the end of 2013. It will be followed by an hybrid sports car BMW i8 in 2014. A full line of electric drive propulsion vehicle is scheduled by 2016 for the Centenary of BMW brand. The BMW i3 has been designed and will be manufactured with brand new methods for mass production of automobile. The parameters for the development of the BMW i3 are specific to all-electric cars with its advantages and limitations mainly limited operating range and long charging time for the batteries. The parameters were verified in extended field trials using the MINI E and BMW Active E by 1000 test customers in ten countries over 20 million kilometres (12.5 million miles). From these field trials with selected user, a clear picture emerges showing 90% of daily journeys with around 45 kilometres ( 28 miles) on average and cars are parked for about 22 hours each day. This time can be used to recharge the batteries. The BMW i3 operating range is quoted for 130 to 160 km (81 to 99 miles). While greater distances can be driven electrically with larger batteries, this currently entails extra weight, higher costs and reduced driving dynamics. 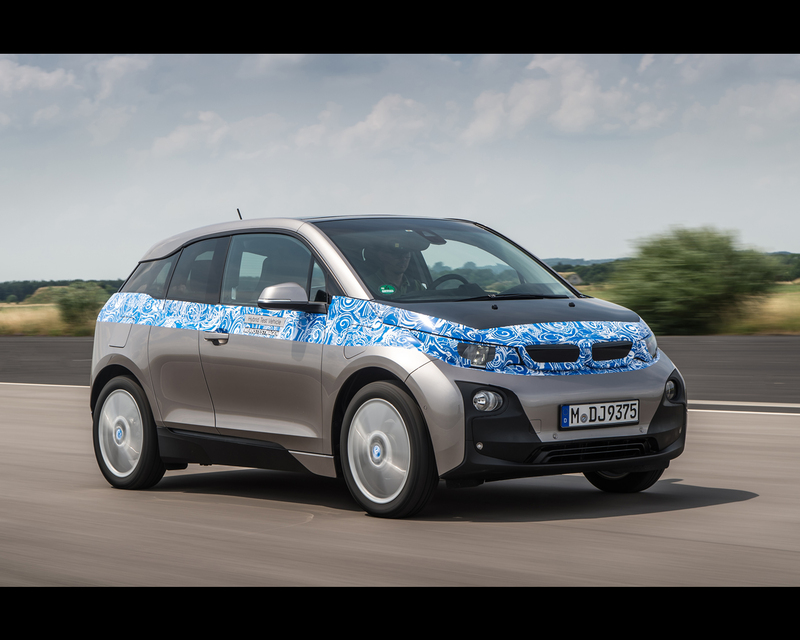 The BMW i3 is intended primarily for use in cities and as a commuter vehicle between work and home, but is also suitable for rural areas as MINI E field trials have shown. If desired, an on-board range extender is available and will extend the range to approximately 300 km (180 miles). A three minute refill will provide another 100 km range. For long distance travel BMW provides flexible mobility solutions including alternative vehicles from the BMW and DriveNow ranges. 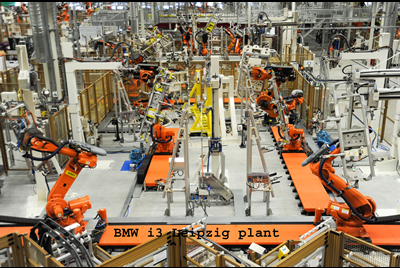 The BMW i3 introduces a revolutionary architecture and consecutive new manufacturing processes. The unique architecture comprises a carbon fibre composite “life-module” for the four àccupants and an aluminium made “drive-module” holding the batteries and driving components. This revolutionary package results in DIN kerb weight of 1.195 Kg, that is some 300 kg lighter than conventional electric cars. The weight of the batteries included in above kerb weight amounts for 230 kg. The BMW i3 is lighter than most compact vehicles, yet offers significantly more space for up to four occupants. It also has the edge over conventionally powered models of comparable size and output in the sprints from 0 to 60 kph/37 mph in a mere 3,7 second and 0 to100 kph/62 mph which it completes in 7,2 seconds. With a time of 4.9 seconds for the sprint from 80 to 120 km/h (50 – 75 mph), it boasts a level of sporting ability that comparably sized combustion-engined cars would require far higher outputs to achieve. Here, the carbon-fibre-reinforced plastic (CFRP) construction of the passenger cell (Life module) plays a central role. Such extensive use of this lightweight and crash-safe high-tech material is unique in volume car production. The principle of lightweight design also governs the aluminium Drive module and the connection between the two elements. The body structure – shaped by its LifeDrive architecture – enables the use of a trailing edge element made by glass-fibre-reinforced plastic injection moulding. And that contributes a 30 per cent weight saving compared with a conventional sheet steel solution. The direct connection between the power electronics and electric motor in the rear of the BMW i3 reduces the length of cabling required and cuts the overall weight of the drivetrain by around 1.5 kilograms. 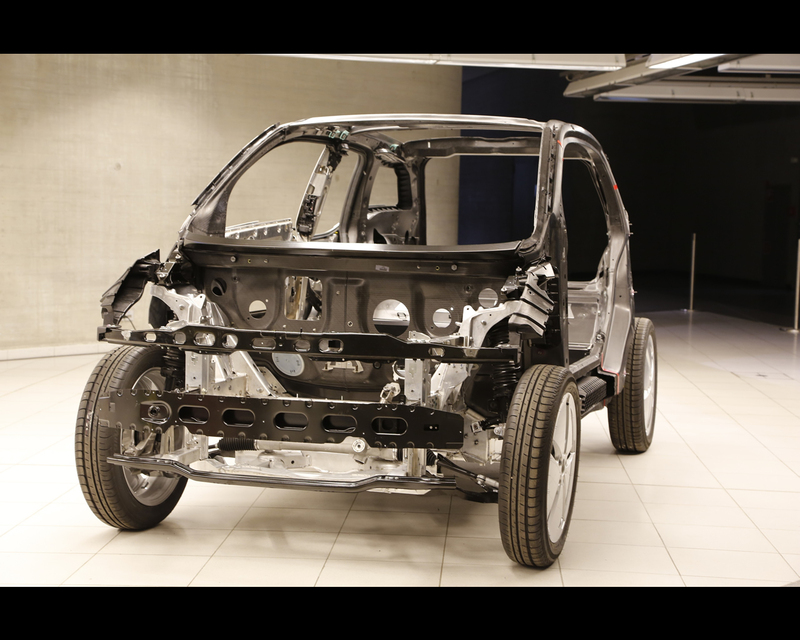 Weight-minimising construction also sets the tone for the chassis components of the BMW i3. For example, the forged aluminium suspension links weigh around 15 per cent less than in a conventional design, the hollow drive shaft is 18 per cent lighter than a conventional equivalent, and the standard 19-inch forged aluminium wheels of the BMW i3 are 36 per cent lower in weight than comparable steel rims of the same size. Using a magnesium supporting structure for the instrument panel saves weight on two fronts. Superior material attributes over conventional sheet steel allow these components to boast optimised geometry, which results in a weight reduction of some 20 per cent. In addition, the high composite rigidity of the magnesium supporting structure lends it a strengthening effect, which allows a reduction in components and lowers weight by a further 10 per cent. The door trim panels are made from renewable raw materials and tip the scales around 10 per cent lighter than conventional equivalents. And the rigorous application of the lightweight design strategy extends to screws and bolts made from aluminium. The engineers’ detailed commitment to the principle of lightweight design is lent visible expression by the honeycomb structure of the windscreen wiper blades. 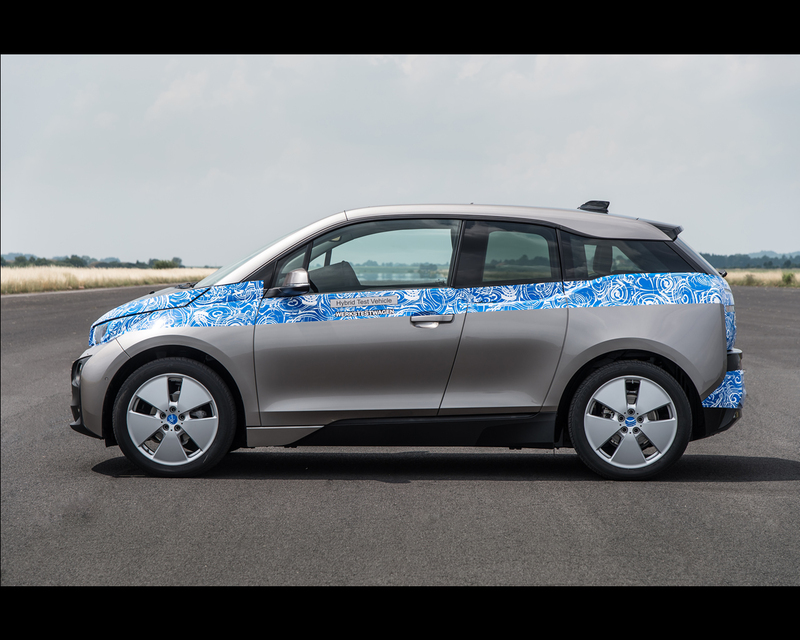 In addition, a cast aluminium mount was developed specially for the wipers of the BMW i3, its force-flow-optimised geometry also yielding a reduction in weight. The hybrid synchronous electric motor developed and produced specially by the BMW Group for use in the BMW i3 generates output of 125 kW/170 hp and puts maximum torque of 250 Newton metres (184 lb-ft) on tap from the moment the car pulls away. Beyond the traditional immediacy of response offered by electric motors when pulling away, power development in the BMW i3 also remains unbroken through higher speeds. Power is sent to the rear wheels through a single-speed transmission, allowing the BMW i3 to accelerate with an uninterrupted flow of power up to its top speed, which is limited to 150 km/h (93 mph) in the interests of efficiency. Also helping to deliver the BMW i3’s engaging driving experience is the single-pedal control feature carefully configured by the BMW Group’s drive system development engineers. Recuperation mode is activated the moment the driver takes his foot off the accelerator. The electric motor switches from drive to generator mode, feeding power into the lithium-ion battery. At the same time, it generates a precisely controllable braking effect. This recuperation is speed-sensitive, which means the car “coasts” with maximum efficiency at high speeds and generates a strong braking effect at low speeds. The ability to accelerate and brake using just one pedal creates an unusually direct interaction between driver and car. Thinking ahead in city traffic can allow the driver to carry out 75 per cent of braking manoeuvres without applying the brake pedal. The brake lights illuminate if the amount of recuperation in progress produces the same braking effect as actually pressing the brake pedal. The conventional braking system only joins the action if the driver summons greater braking power by depressing the brake pedal. 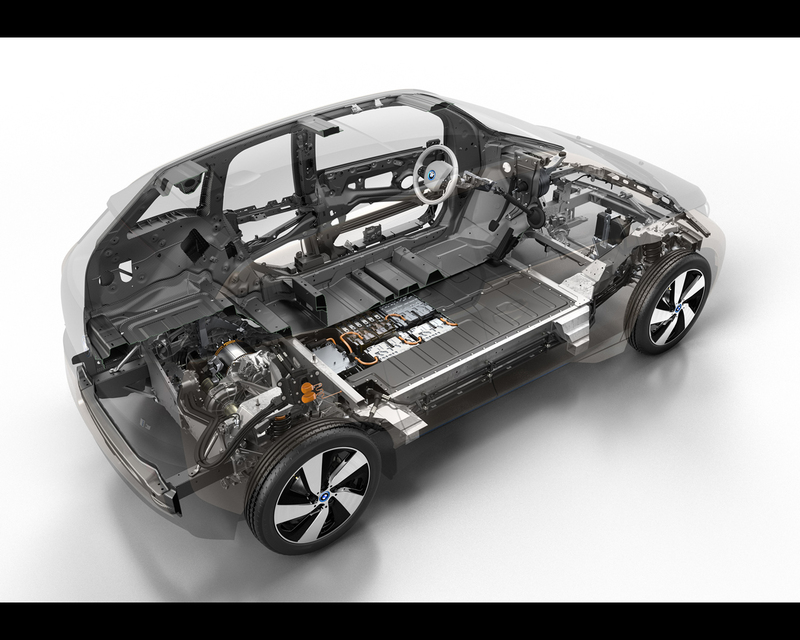 The high-voltage battery in the BMW i3 consists of eight modules (each with 12 individual cells), which together produce a rated voltage of 360 volts and generate approximately 22 kilowatt hours of energy. The lithium-ion cells used in the battery stand out with their high energy density and impressive cycle life. They are designed to perform their energy storage function over the vehicle’s entire lifespan. In order to maintain their output and storage capacity over time, the battery management system therefore controls both the charging and the discharging processes, as well as the operating temperature of the cells. When the vehicle is on the move all the cells are used equally to supply energy. However, it is also possible to replace individual modules in the event of a fault. The air conditioning coolant is used to provide extremely effective cooling of the high-voltage battery, and this fluid can also be warmed using a heat exchanger. All these characteristics enable the optimum operating temperature of around 20 degrees Celsius to be reached before a journey begins, even when the ambient temperature is low. This preconditioning ensures the battery operates to optimum effect in terms of power output, range and durability. 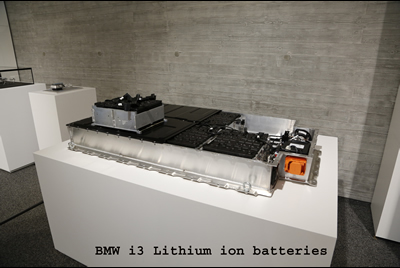 The BMW Group has planned and developed this battery to last for the full life of the vehicle. The battery warranty is valid for eight years or 100,000 kilometres (62,000 miles). Apart from procurement of storage cells from a specialist manufacturer, all the development and manufacturing stages are carried out at the BMW Group. The high-voltage battery is produced on a state-of-the-art assembly line at BMW Plant Dingolfing. If desired, the BMW i3 is also available with a range-extender engine, which maintains the charge of the lithium-ion battery at a constant level while on the move as soon as it dips below a specified value. This role is performed by a 650cc two-cylinder petrol engine developing 25 kW/34 hp and mounted immediately adjacent to the electric motor above the rear axle. The range extender increases the car’s maximum range in day-to-day driving to around 300 kilometres (approx. 180 miles). One full gasoline tank provides the equivalent of an electric around 100 km range depending on driving conditions. The link-up between driver and car also enters a new dimension in the BMW i3. The BMW ConnectedDrive Remote app for BMW i enables smartphone access to useful vehicle data for journey planning. If the BMW i3 is hooked up to a charging station or the BMW i Wallbox, the supply of energy can be controlled via smartphone, while the air conditioning and heating function for the high-voltage battery pack can also be activated remotely. In addition, customers can use their smartphone to send destinations to their car’s navigation system. The app also shows the driver charging stations (both available and in use) and can establish if the car has sufficient power remaining to reach them. The car’s range limit display on the smartphone screen replicates that provided by the car’s navigation system. 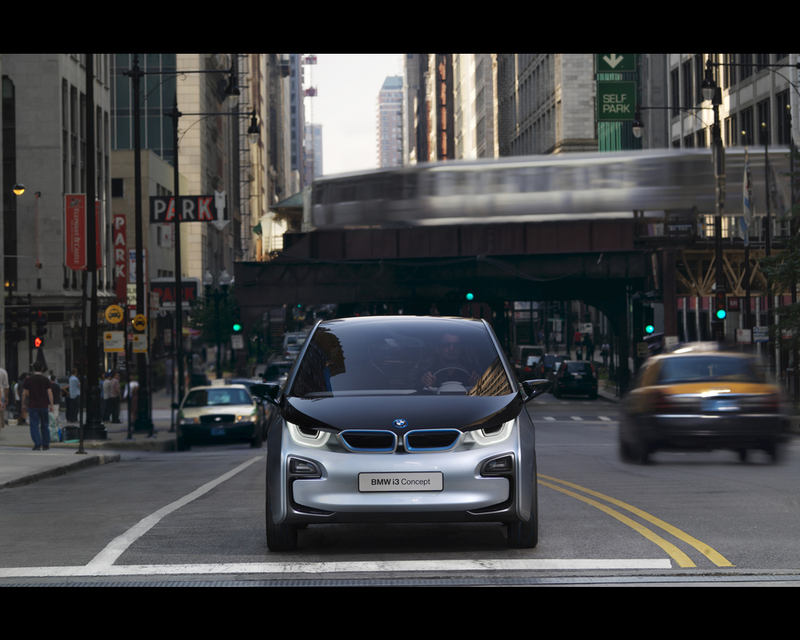 The BMW i3 is also available with an array of other innovative BMW ConnectedDrive driver assistance systems developed specifically to enhance convenience and safety in urban conditions. These include Driving Assistant Plus, Parking Assistant, a rear view camera and Speed Limit Info. BMW i offers an extensive range of products and services in its 360° ELECTRIC package designed to meet all individual customer needs for energy supply and journey planning. 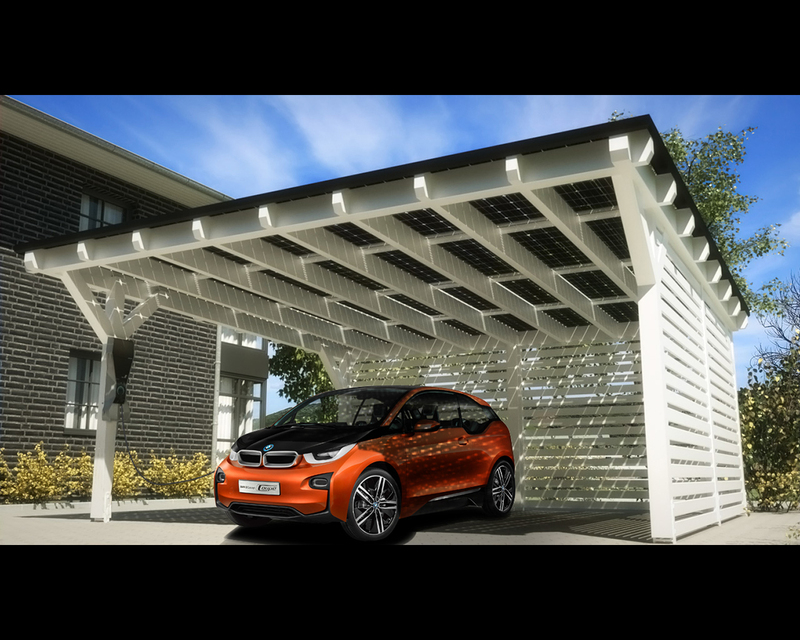 The spectrum of services ranges from the installation of the BMW i Wallbox in the customer’s garage and special renewable energy supply offers, to the charging card for user-friendly access to the public charging infrastructure and additional assistance services from BMW ConnectedDrive. If the BMW i3 concept fails to meet mobility requirements in a specific situation, 360° ELECTRIC provides flexible mobility solutions including alternative vehicles from the BMW and DriveNow ranges. In order to compensate for the extra weight of the electrical components, BMW i consistently uses lightweight construction and innovative materials in its vehicles. The concept and production of the car were also completely redefined at the outset. 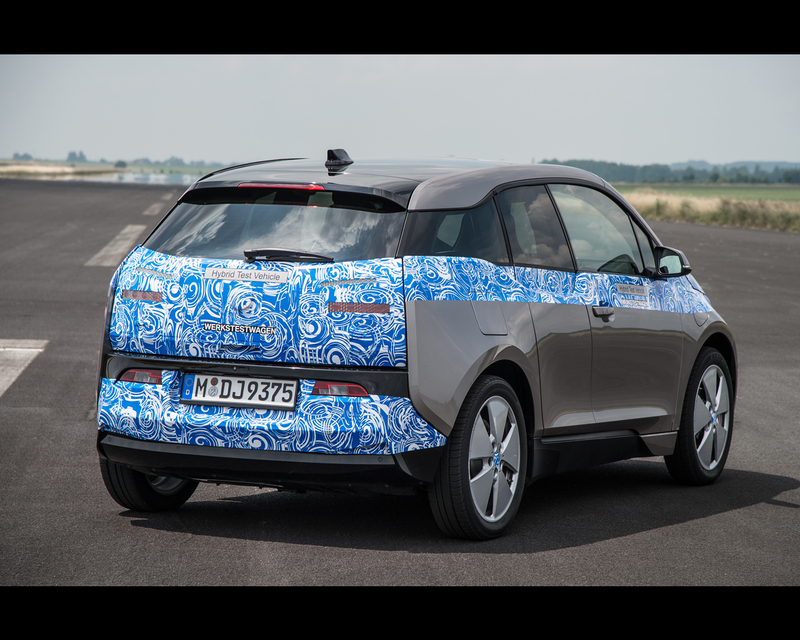 The Life module – the passenger cell of the future BMW i3 – is made primarily of carbon fibre-reinforced plastic, i.e. CFRP. The use of this light and crash-resistant high-tech material on such a scale is unique in the mass production of a vehicle, as the large-scale use of CFRP was previously deemed too expensive, and the processing and manufacture too complex and insufficiently flexible. But BMW recognised the potential of the material early on, and after over ten years of intensive research and process optimisation, materials, systems and tools, the BMW Group is the only automobile manufacturer to possess the necessary expertise for industrialised CFRP mass production. The advanced level of the production process today is discernible above all in the process safety achieved, the fast cycle times, and the high standard of quality in the CFRP components produced. 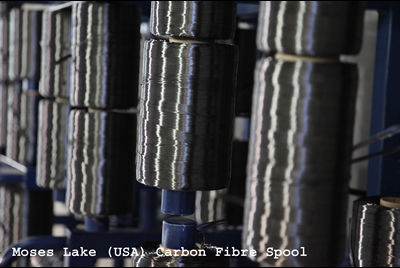 Moses Lake: carbon fibre manufacture with hydroelectric power. A precursor, a thermoplastic textile fibre made of polyacrylonitrile, is used to create the carbon fibre at SGL ACF in Moses Lake, U.S.A. All elements of the fibre are split off in gaseous form in a complex, multi-stage process until only one fibre is left consisting of virtually pure carbon with a stable graphite structure. This is only seven micrometres (0.007 millimetres) thick, compared to a human hair, which measures around 50 micrometres. For use in the automotive sector, around 50,000 of these individual filaments are combined into “rovings” or “heavy tows” and wound for further processing. In addition to the automotive applications, fibre composites of this thickness are also used in large turbine blades of wind power systems, for example. To manufacture the carbon fibres in Moses Lake, all of the energy for production is obtained renewably from locally available hydroelectric power, making it 100 per cent CO2-free. The ultramodern works in Washington State also sets standards in energy efficiency. In comparison to conventional CFRP production, the CO2e (global warming potential) saving is around 50 per cent. 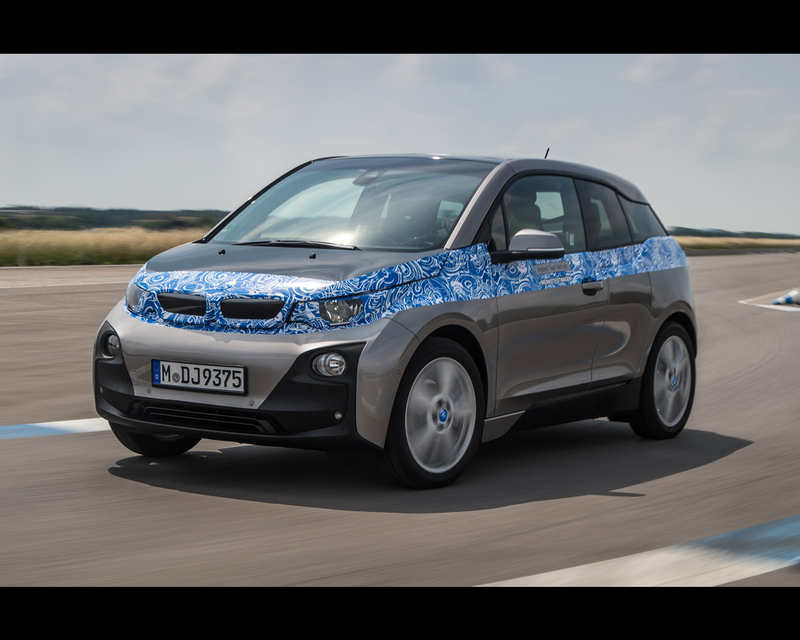 In order for the BMW i3 to roll off the assembly line in Leipzig on schedule at the end of 2013, the ultralight high-tech fibres have been in production since the end of 2011. Two production lines each with a current capacity of 1,500 tonnes per year ensure the necessary supply. This constitutes a supply of around ten per cent of global CFRP production today. 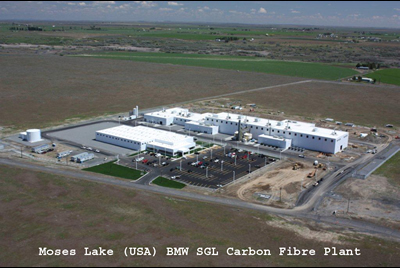 The two parent companies BMW Group and SGL Group have invested around US $100 million in the production facility in Moses Lake to date and have created 80 new jobs. Wackersdorf: processing into textile fabrics. At the second site of the joint venture, in Wackersdorf Innovation Park, the fibre bundles produced in Moses Lake are further processed into light textile fabrics on an industrial scale. Unlike woven fabrics, the fibres are arranged side by side on one level rather than interlaced or interwoven with each other. A woven structure would bend the fibres and reduce the excellent properties somewhat, because it is the fibre alignment itself in the fabric that guarantees the optimal characteristics of the eventually produced component. After an investment of EUR 20 million and the creation of around 100 new jobs, today several thousand tonnes of carbon fibre fabrics can be manufactured per year at the Wackersdorf site. 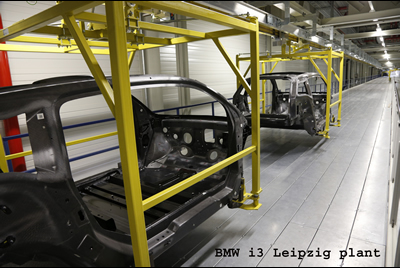 These form the starting material for the manufacture of CFRP parts and components in the BMW works in Landshut and Leipzig. Landshut: further processing into CFRP components. The carbon fibre fabrics supplied from Wackersdorf are further processed into CFRP body parts at the pressing plants in Landshut and Leipzig. In Landshut, the BMW Group specialists have succeeded in further developing and automating the manufacturing process for CFRP components in the last ten years to such a point that today, economical and high-quality mass production with high process safety is possible. 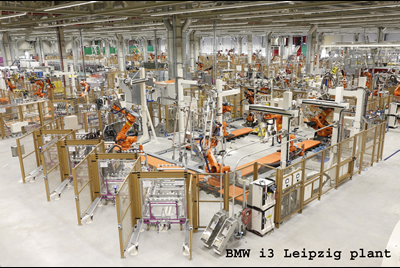 The roofs for the BMW M3 and M6 models and the bumper supports for the M6 have already been in industrialised CFRP production in Landshut for some time. After an investment of EUR 40 million and the start of carbon production with around 100 employees in March 2012, the Landshut site is considered the definitive innovation and production centre for CFRP components. Landshut relies on its own junior staff to secure the high level of technical expertise needed for processing innovative lightweight construction materials, increasing the number of trainees to 40 young employees per year. Leipzig: proprietary material manufacturing with variable formulation. 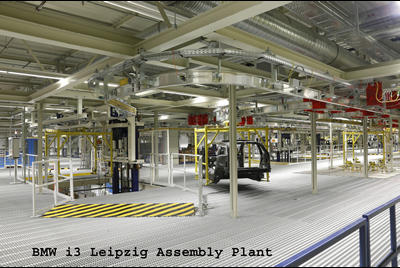 The newly established pressing plant in Leipzig is equipped with state-of-the-art technology for CFRP in automotive manufacture. BMW now manufactures its own carbon fibre composite materials at this facility designed for industrial mass production. The formulation, i.e. the composition, strength and geometry of the CFRP parts, can be individually modified or adapted in the pressing plant at any time during the manufacturing process depending on the design specifications. The tailor-made carbon fibre fabric supplied from Wackersdorf is first formed into its eventual shape in the preforming process. A heating tool gives the laminate a stable, three-dimensional form. Several of these preformed workpieces can then be assembled into a larger component. This makes it possible to manufacture large body components, which are difficult to produce in aluminium or sheet steel. After finishing and preforming, the next process step is resination under high pressure using the RTM process (Resin Transfer Moulding). The RTM resin injection procedure used in the aerospace industry and in boat and wind turbine construction involves injecting liquid resin into preformed workpieces under high pressure. The bonding of the fibres with the resin and the subsequent hardening lends the material its stiffness and thereby its excellent properties. With a closing force of up to 4,500 tonnes, the pressing plant works in accordance with precisely defined time, pressure and temperature parameters developed in-house until the resin has bonded with the hardening agent completely and is cured. This special proprietary BMW manufacturing process eliminates the need for an additional time-consuming curing process in a separate oven, which usually follows a CFRP pressing step. This new pressing plant specially designed for CFRP does not resemble a conventional sheet steel manufacturing facility. The production-specific investments have a much more streamlined investment structure, significantly reducing construction costs through the elimination of a classic paintshop and cathodic immersion bath coating, for example. The production process is trend setting, saves a huge amount of time and makes the industrialisation of large CFRP composite components realistic for the first time. This is the only way to obtain preformed parts from the pressing plant in a matter of single-digit minutes. 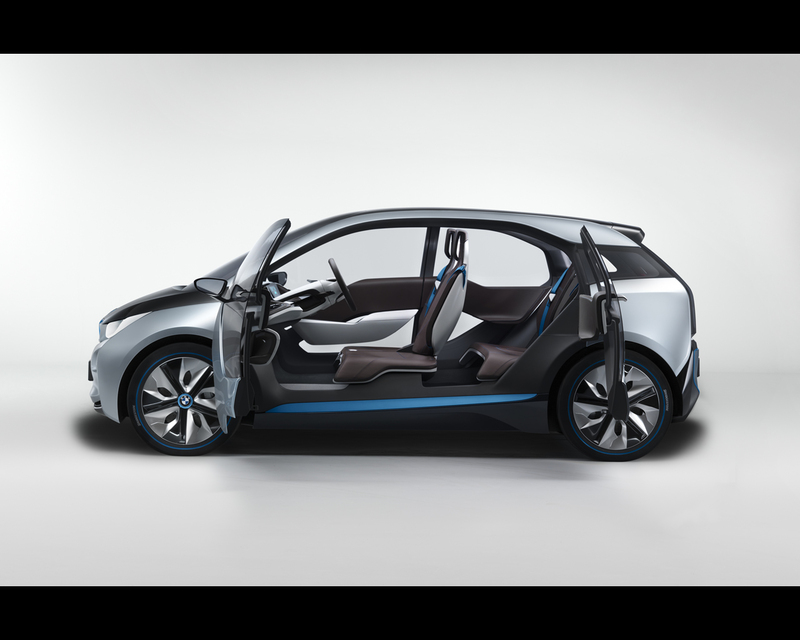 Even complex assemblies such as an entire side door frame of the BMW i3 Life module leave the facility with many structural elements already integrated, optimal product quality, flawless functionality and very high fitting accuracy. The only remaining tasks are refinements such as precision cutting of the component contour and the insertion of any missing openings. For this, the parts are processed with a special waterjet cutting system, sandblasted, and the adhesive surfaces roughened for further processing. Unlike the CFRP preformed part, it would be necessary to assemble several internal and external components in succession for a traditional sheet steel side frame. 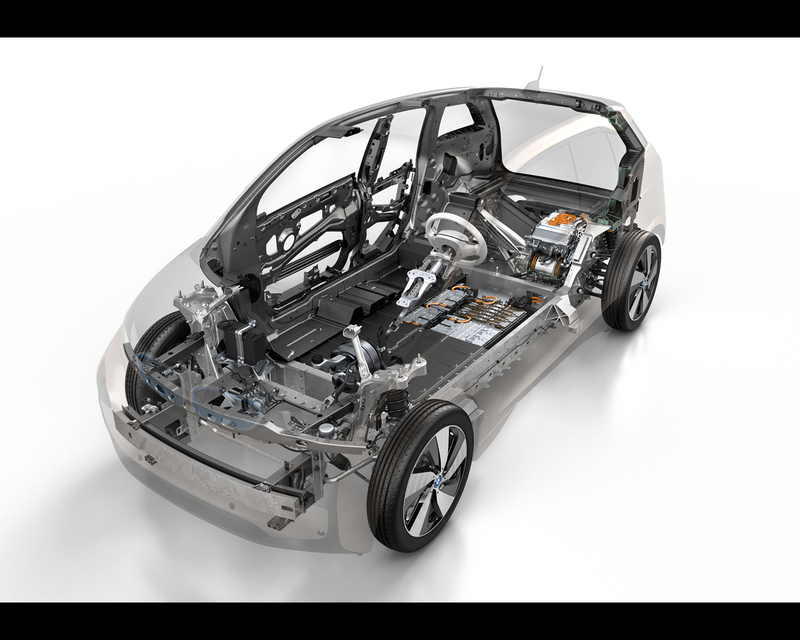 A normal sheet steel architecture requires significantly more body parts overall and so would be heavier than the LifeDrive module of the BMW i3 because of its design. Revolution in car body construction with new precision tools. 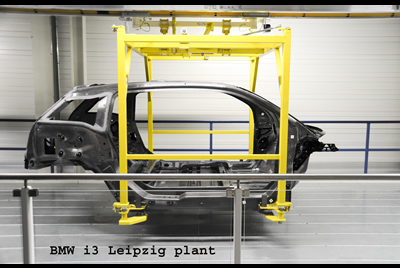 The newly produced CFRP composite components from the new Leipzig pressing plant and supplied CFRP parts from the Landshut pressing plant are assembled in the new car body construction hall. 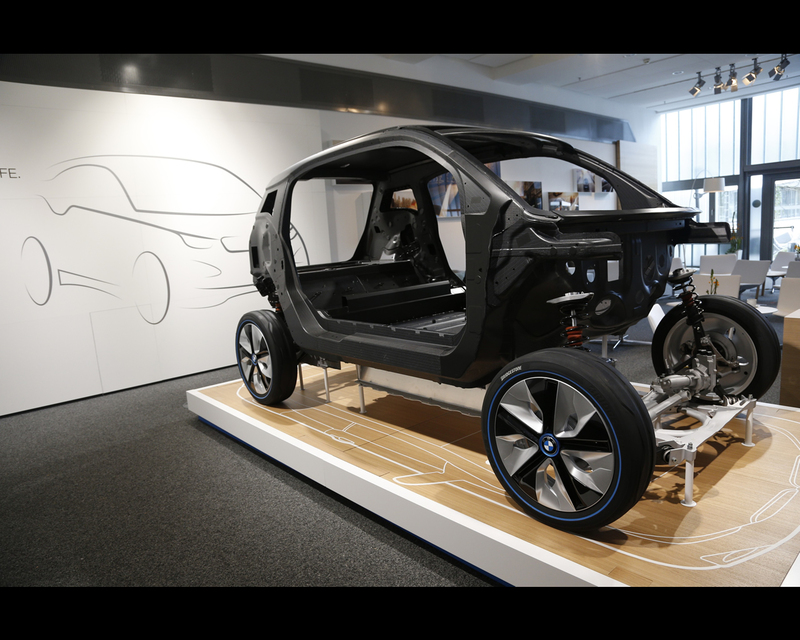 Around 150 parts, one third fewer than in the conventional sheet steel construction, make up the basic form of the Life module of a BMW i3. There is no noise pollution from screwing or riveting, no sparks flying during welding, and only the latest adhesive technology is used, which is 100 per cent automated. A technology mastered by BMW alone. In the unique joining process developed by BMW, the individual components are assembled without touching to an adhesive gap of 1.5 millimetres in order to ensure optimal strength after the adhesive procedure. In the newly developed manufacturing process, all connecting components in the Life module are always separated by the same gap and so receive the same amount of adhesive. Only this precision guarantees perfect power transmission between the individual CFRP components and therefore the highest standard of quality in the mass production series. In total, there is a precisely defined bonded range per car of 160 metres in length and 20 millimetres in width. Time saved with instant adhesive. Nowadays, CFRP car body compartments are generally only manufactured for special vehicles, in racing and for extravagant individual sports cars. The production costs are of comparatively minor importance for these small production quantities. The curing time for the adhesive bonds can be more than one day. 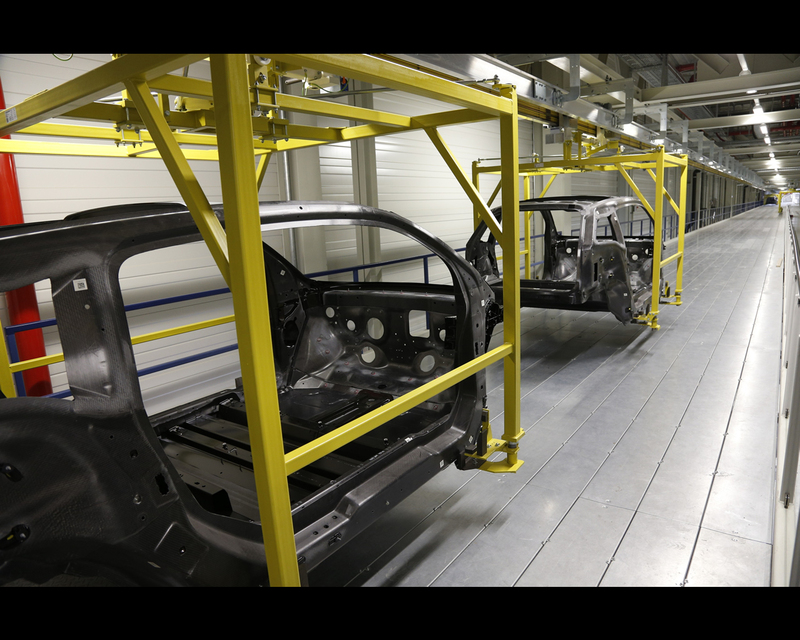 To minimise this time for mass production of the BMW i3, BMW has greatly accelerated this curing process. A newly developed adhesive can now be processed for only 90 seconds before developing adhesion following application to a component. Half an hour later it is hard. This property represents a ten-fold acceleration of a traditional bonding process. In order to further reduce the curing time to the single-digit minute range, BMW has developed an additional thermal process. This involves additional heating of specific adhesion points on the CFRP parts to be bonded to further accelerate the curing process by a factor of 32. Colour concepts can be chosen up to six days before final assembly. The high-strength CFRP passenger cell (Life module) manufactured in Leipzig passes from body construction to the new assembly hall where it is bonded with the aluminium Drive module. The basic Drive module supplied from Dingolfing is completed in Leipzig before being screwed and glued inseparably to the Life module. Only then does the internal CFRP Life module cell receive its final external plastic housing. For the painted multi-part outer skin, thermoplastic injection moulded plastics are primarily used, as is also the case in traditional vehicle construction (front/rear apron, side sill etc.). The coloured plastic preformed parts are screwed inconspicuously to the interior Life module cell during final assembly using special mounts. In the course of developing the BMW i, the BMW Group devised the first recycling concept of its kind worldwide for CFRP components, body components and sorted production waste which was suitable for series production. In different procedures, the valuable recyclable materials from production and even from damaged/scrapped vehicles are reused in automotive construction and channelled back to the production process or used in other applications. In the recycling process, carbon fibre recycling with “dry”, unresinated material is differentiated from composite material recycling (CFRP), in which “wet”, resinated plastics are used. The dry carbon offcuts created during production can be reprocessed into valuable non-woven textiles and reused in the manufacturing cycle. 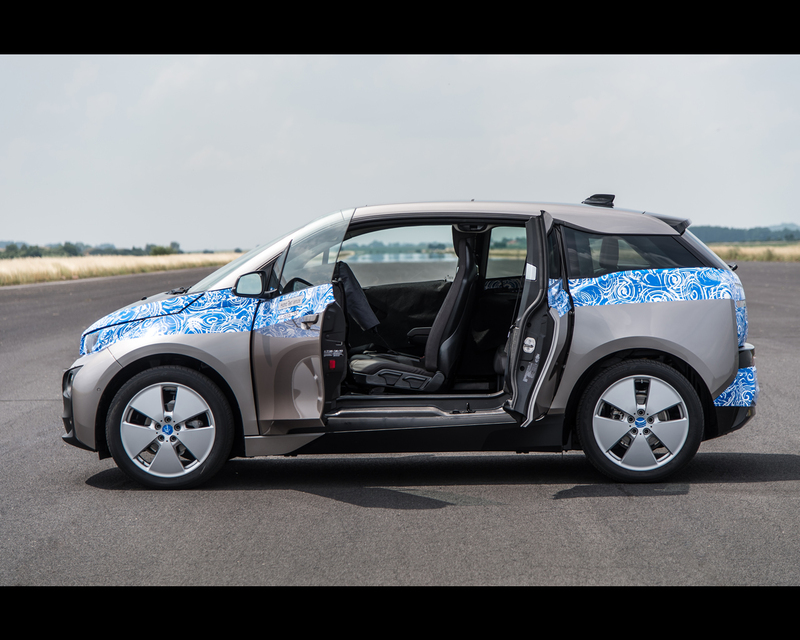 Around ten per cent of the carbon fibre used in the BMW i3 now is recycled material, a process unique in the automotive industry worldwide. In composite material recycling – the processing of resinated carbon fibres – CFRP is first separated industrially from the mixture with other plastics and, for example, processed in a pyrolisis facility. The heat from the resin breakdown process is used to separate the undamaged carbon fibres. These fibres can then be used to manufacture components and reduce the new fibre requirement. For example, the rear seat pan is made from this recycled carbon fibre. It meets the BMW quality standard 100 per cent and weights 30 per cent less than the conventional glass fibre matt construction. Ground or cut into short fibres, the recycled CFRP or carbon fibres are also used in many areas outside the automotive industry, for example, in the textile and electronics industries (housing material for control units). The use of “secondary CFRP fibres” is part of a sustainable material cycle that spares resources and secures raw materials for future uses. Overview of main vehicle specifications. BMW i3.